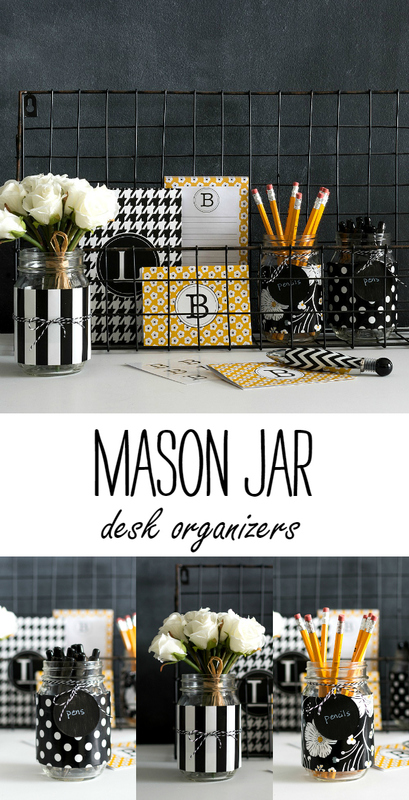 Mason Jar Desk Organizers – Easy Mason Jar Craft to Get Organized! There were no champagne toasts at the stroke of midnight. No flurry of texts to family and friends wishing them a happy one on January one. No FOMO-inducing Facebook and Instagram posts with hats and horns and over-sized 2016 glasses shared. or even a look ahead at all the amazing things I plan to accomplish in 2016 (fingers crossed). … you will not go away. Leaving me to reluctantly accept the passing of another year. With a caveat. I’m not going lightly. 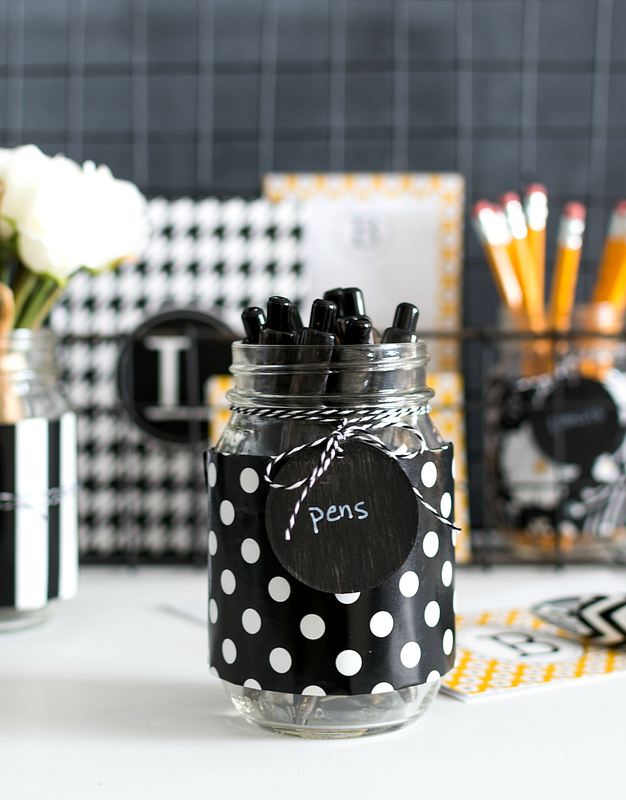 So I thought I’d ease into 2016 with an super easy desk organization idea. Using mason jars. And wrapping paper. 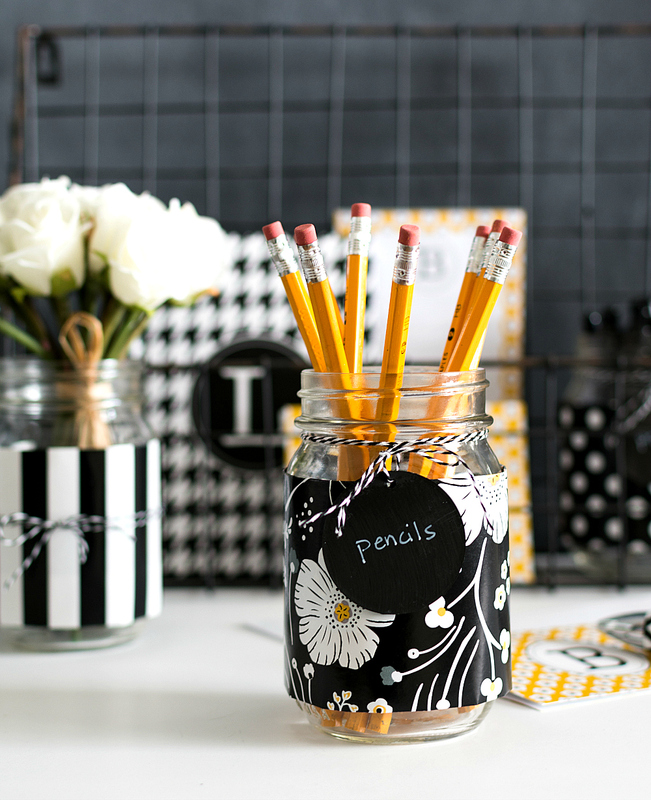 To create mason jar desk organizers. Finish it off with some baker’s twine (also found in those Michael’s bargain bins) and a chalkboard tag (it’s just a cardboard gift tag left over from Christmas that I painted with chalkboard paint). 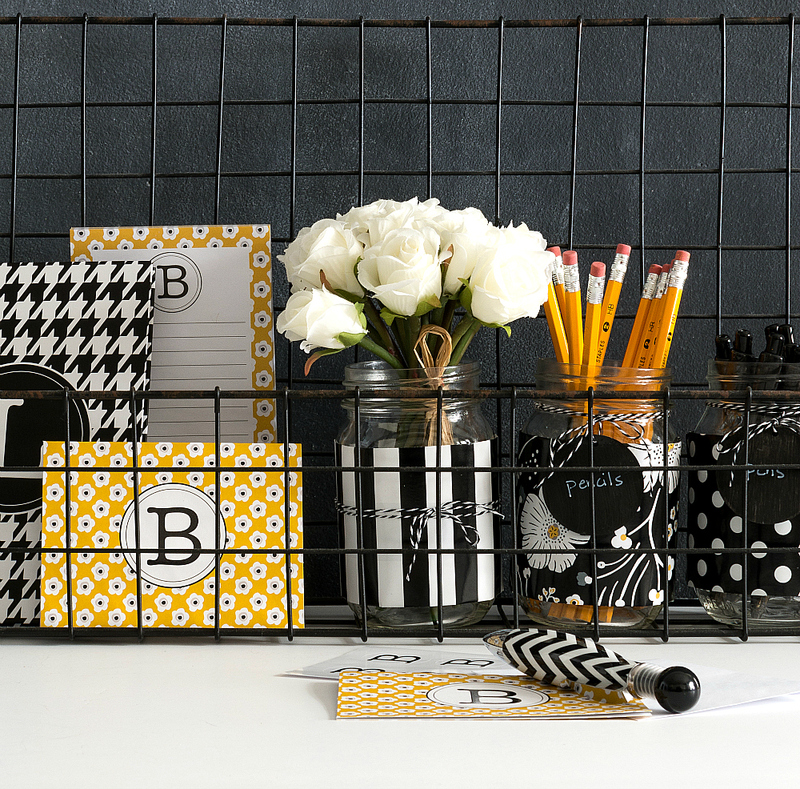 Any and all pins of the Mason Jar Desk Organizers image below are greatly appreciated! 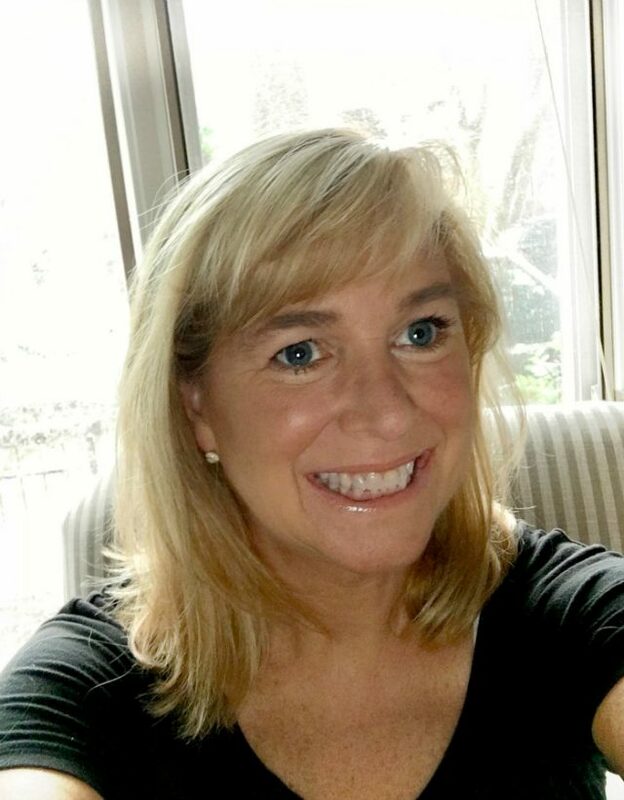 Happy 2016 Linda…looking forward to your beautiful projects…those mason jars in the black and white designs are truly beautiful…I am currently redecorating my granddaughter’s room…so you have given me some really great ideas! Have a great day!!! Happy 2016 to you too Shirley! so stinkin pretty and easy. 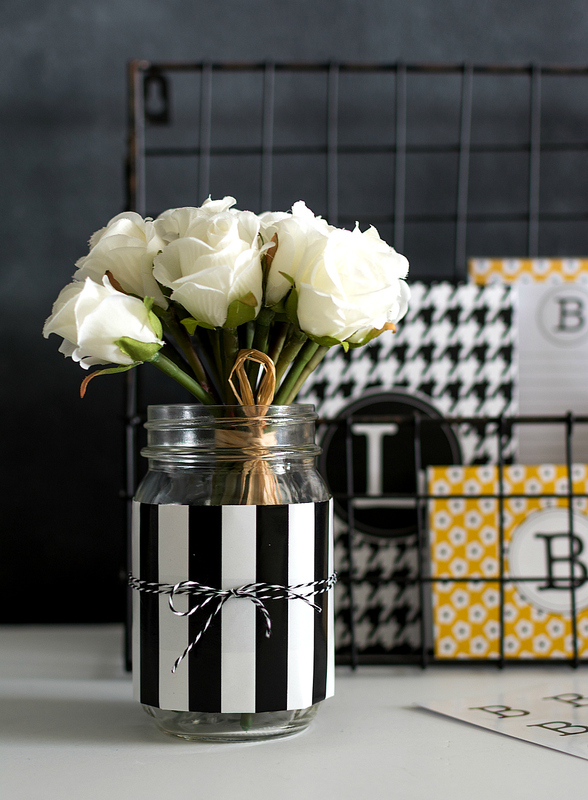 no one does a mason jar like you…no one! I am so happy for your faithfulness in showing “the designers” out there that there’s a bunch of us that still love Mason jar stuff. I just gazed and admired for sooo long that I never owned any painted until last year when you inspired me to take the plunge. I love this post today. I have just the spot for it. It looks so pretty so cheerful!! And yes, I’m one that says, Thank you for showing me how you put the paper on, what kind of paper it is, etc. I totally love the cute bathroom set. I am forever looking over the ideas you glean from others as well. “They” said Mason jars are out for 2016. Not for me!!! I’m just jumping on board! Hey what do “they” know anyway. Last year one of fabric clerks at our Hobby Lobby told me burlap was out too. Uh don’t think so. 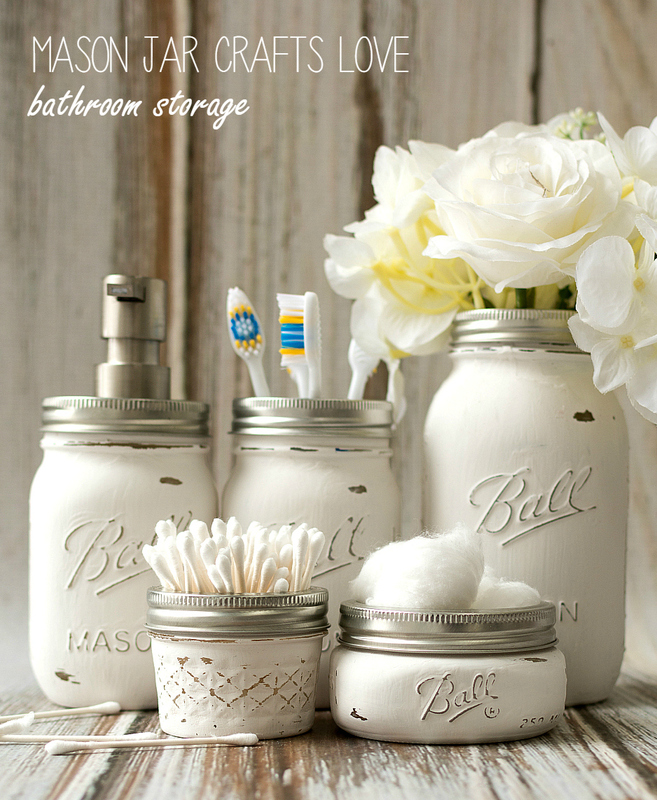 I think idea of Mason Jars Forever club is fantastic, lets go for it. 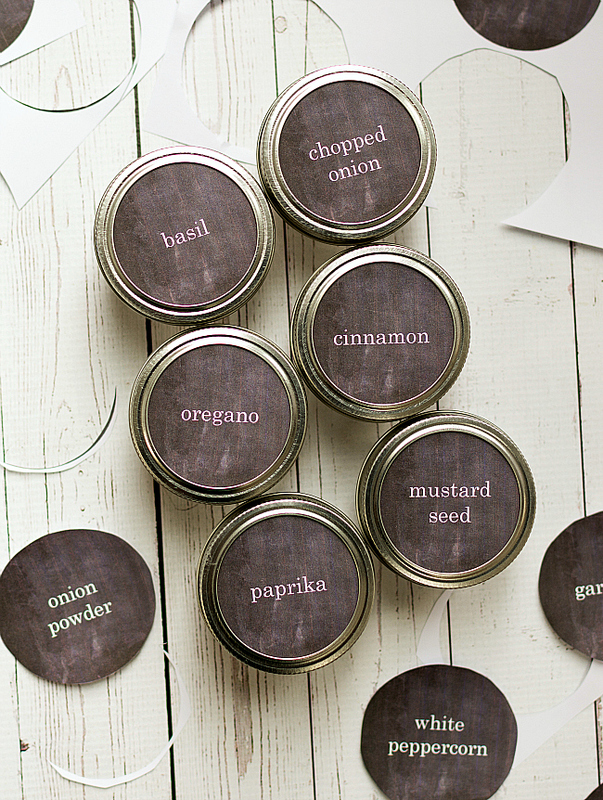 What would we do without mason jars? All your projects you featured are so great, love bathroom set also, think I’ll be doing that for summer, have nice change. Pinning all of it. 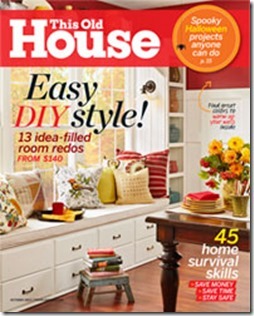 Love your desk organizing set Linda, they’re so perky and cheery, what we need this time of year. I have some aqua papers will be perfect for this, now just to be able to get into my craft room (should call it storage room right now, shame on me) to get papers and jars out. I mean it’s a total disaster in there. Will be digging out my supplies so can work on this, might inspire me to get more done, (lets hope). Last year said was going to get a storage garage to keep some things in but still haven’t, the mess is making me more crazy. Not quite ready to dig in to do complete gutting/clearing out but when this shoulder and arm work right sure will,. like to do jobs like that in winter. After I finish this need to go over to look in your mason jar blog, haven’t been over there for while, at least since before surgery. Want to see what brilliant ideas you’ve had and worked on. Shame on me for not visiting more often. Love this and your other blog. So how is your son liking college? Hope he’s settled in well. What’s his major or is he not sure yet? How many kids 18 know what they want to be, are working toward? Our grand daughter went back to college in CA last Saturday early. She won’t be back home again til next Christmas as she’ll be going to San Diego right after college lets out in May to stay with her aunt (my oldest daughter) will be working with her to save money for her trip to Italy. In June she’ll fly to Italy to be an AuPair for a family til she goes back to college in August. They’ll be taking a trip to Copenhagen before she goes back so she’ll have quite an experience this summer. I’m very envious but will miss her very much. She doesn’t like it here anyway, too country and slow compared to San Diego. Our daughter doesn’t think much of Grand Junction either, they moved here from San Diego in 2004. We’d lived in S.D since she was 17 months old. Have great weekend, take care of yourself. Oh is it 2016? I’m not going without you. You know what I was told? That antiques are out of style, too. 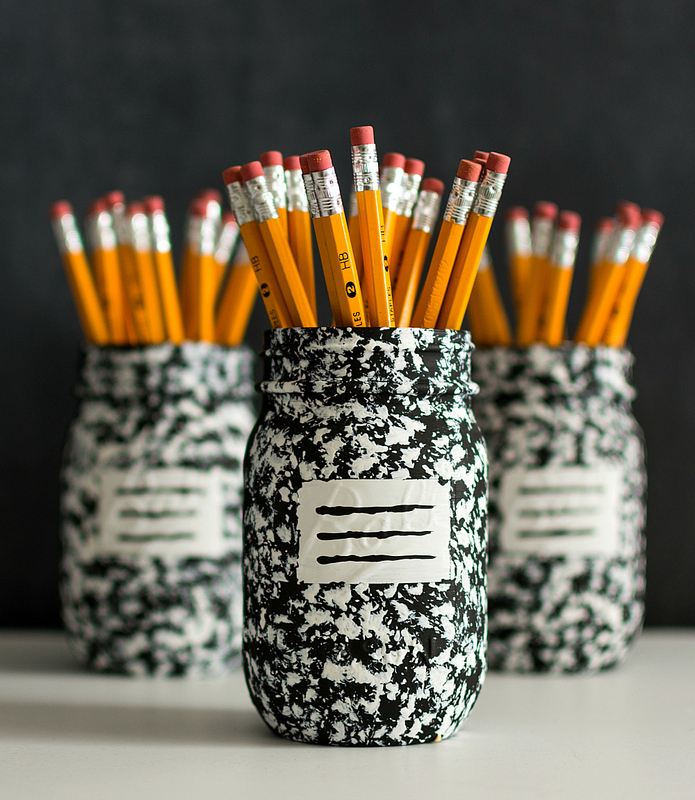 I call BS–I LOVE your jars! Especially those white ones. I want some for my bathroom. 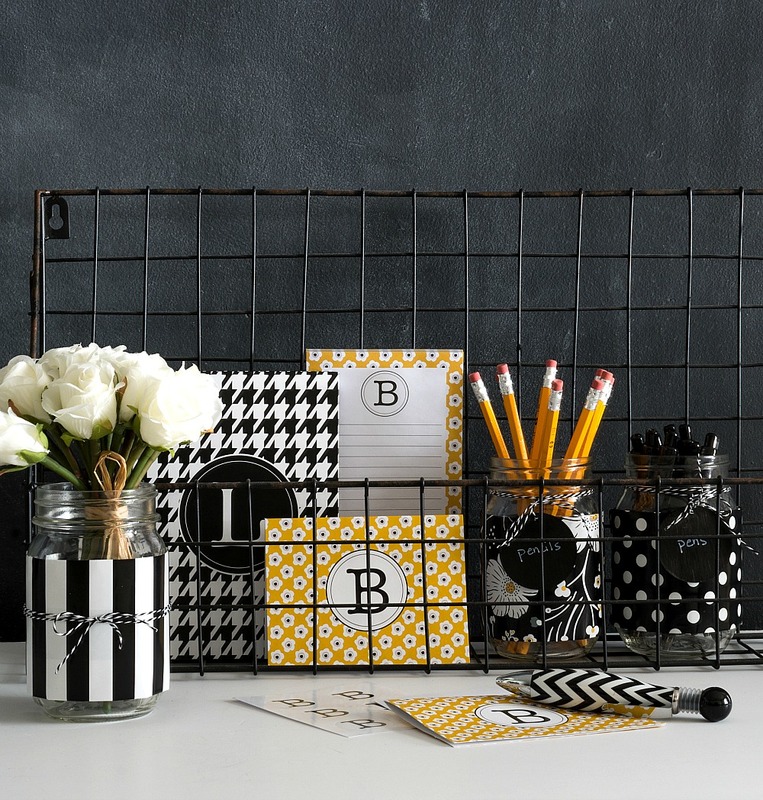 Love the black & white theme of your organizer. The pop of yellow adds the perfect touch! Saw this on That DIY Party. I hope you’ll stop by the Cottage sometime! This post is awesome. I think I’ve found my inspiration for my new office space. Do you remember where you got the black metal thing from that’s holding the note cards and extra items. Hmmm … I’m not sure. I’m thinking it may have been World Market. Oh. Just FYI. I have not made this yet. I had a mason themed Bunco party!!! Gleaned ideS from you. Even got recipe cards off amazon. Cutest napkin holder with darling S&P little mason jars. Made a made up dessert in the purple mason jar. Fabulous. Was a big hit. 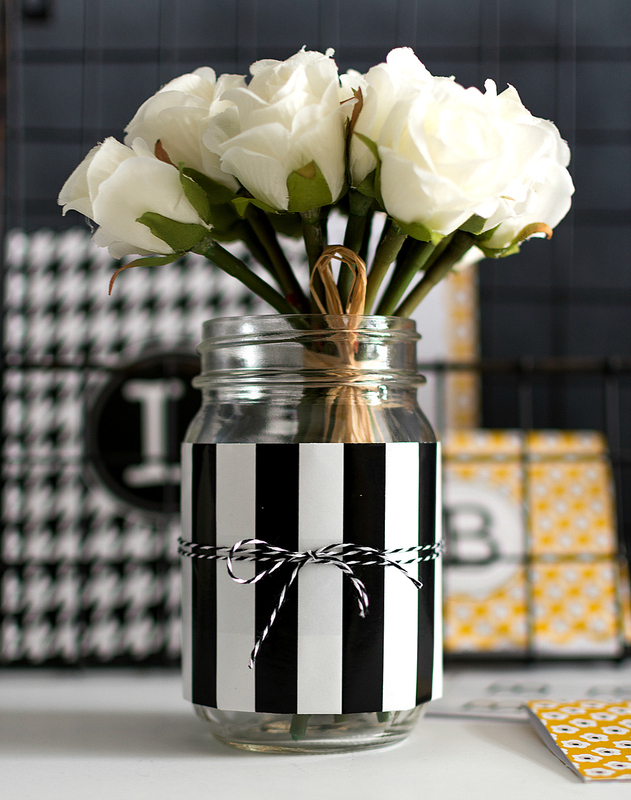 I simply love the houndstooth with stripes and splash of yellow. Too bad I don’t do patriotic. Michaels had cute wrapping in various patriotic wrap 70% off tonight. No!!! 50 cents!!!! But I’ve saved this email just to cheer me and inspire me. Here’s a project I shall do??? Just came across this pin I love it. Where can I buy a similar wire basket with stand to put my mason jars in?